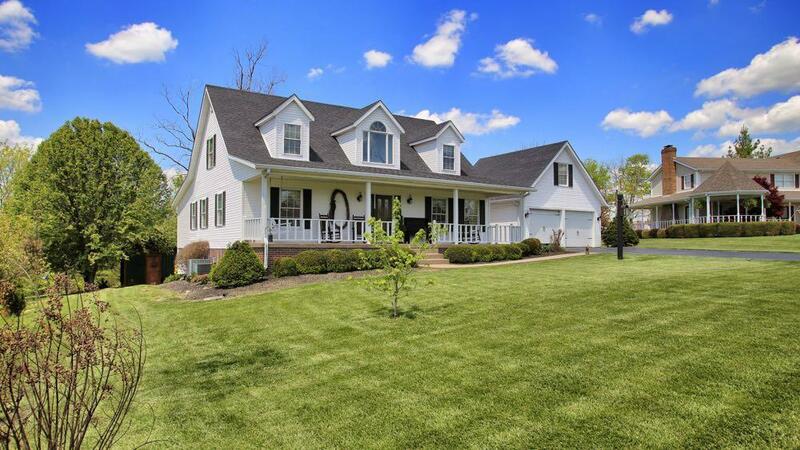 Bring your golf cart to this Kentucky Country Home in a Golf Course Community. Stanford, KY is located between Lexington, KY and Lake Cumberland. All the shopping, medical and recreational stuff you need — and on Dix River Country Club Golf Course. You are about 2 blocks off the fairway here. Full finished, walk-out basement, 2 car garage, screened in porch and a pool. Decorated well – well taken care of and I hope you love it as much as I do. Call or text – 859-379-5263 VIDEO of Kentucky Country Home Golf Course Community. VIDEO Translation: Being as enthusiastic with all these houses lately you’d think that I love every house, well simply not true, we get some houses that are just okay and we get some houses that are not exciting at all. This is like a triple wow house, okay you’re right here in… the highway, I don’t know if you can see the highway there, is maybe half mile away, so you just pop on out this road, and the golf course is just right there and it’s a very challenging golf course, Dix River Country Club, I’ll show you that and I’ll put the dues down here too as well, it’s just a golf cart ride away, and you pop out to the highway, you’re just maybe a mile or two to shopping and make a right, go to Lexington and you make a left you go to Lake Cumberland.